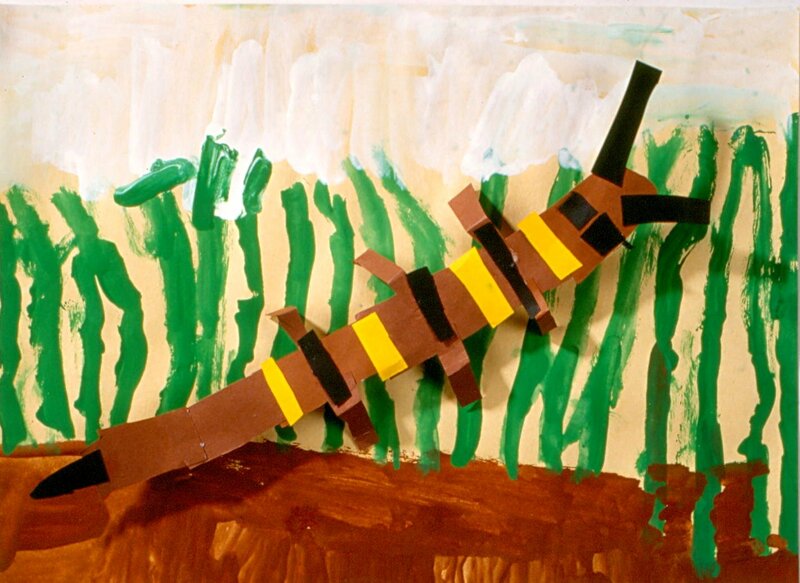 The children construct bugs with paper and glue, paint their habitats, and attach the bugs to be three-dimensional. For ages 3 to 6. Plan 3 sessions. Set out the construction paper for cutting. Have pictures of bugs available for discussion. 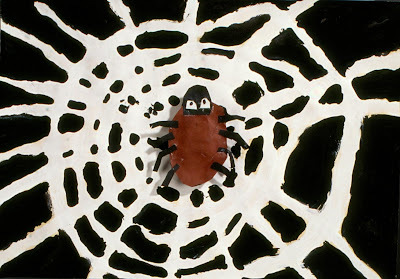 Explain to the children that in this session they will be making bugs using paper and glue. In the next session they will be painting the habitats or places where the bugs can be found. While looking at the pictures of bugs, discuss the three main parts of their bodies (head, thorax, and abdomen.) Point out examples, such as ladybugs, where the body parts are hidden by the wings. Explain that insects have six legs and two feelers, while arthropods (spiders) have four legs and no feelers. Discuss other characteristics, such as stingers, mandibles, and distinctive patterns on individual bugs. Show the children how to use scissors by putting the thumb in the small hole and two to three fingers in the large hole. With the blade of the scissors opened wide, place the paper deep into the opening, taking advantage of the whole blade when cutting. Demonstrate how to attach two pieces of paper with glue by applying glue to the smaller paper and pressing it together with the larger paper. Warn the children that it doesn’t take much glue to attach the pieces. Instruct them to use the dampened sponge on their table to wipe sticky fingers. Have the children construct their bugs and then set them aside to dry. 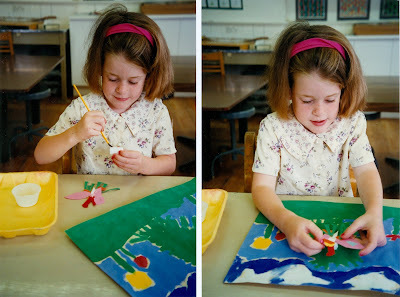 Set out the 12- by 15-inch construction paper for painting. Explain to the children that in this session they will be painting the habitats of their bugs. Discuss some places where bugs might be found, such as in a garden, in a hive, or simply in the grass. The children should paint the habitats from the bugs' point of view. For example, a bug in the grass would probably only see very large blades of grass. Emphasize that the children should make the habitats large enough to fill the papers. 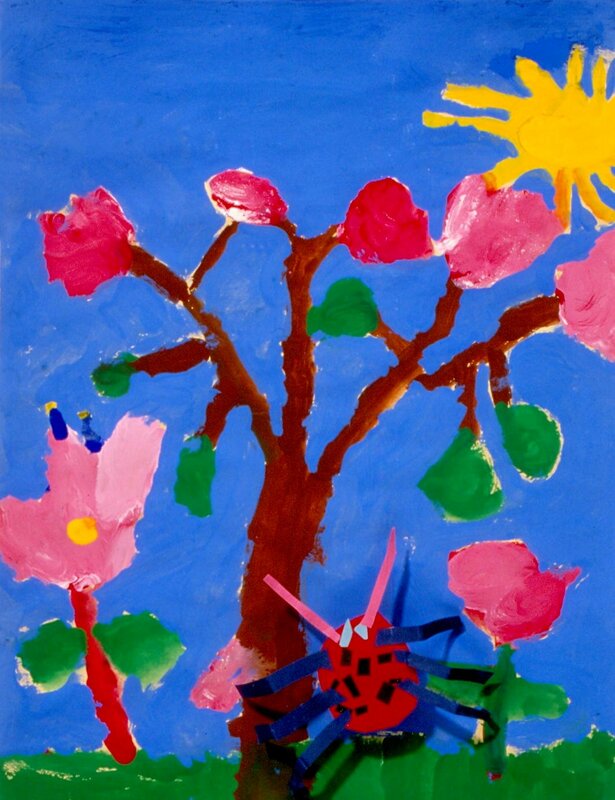 Have the children paint their bugs’ habitats and set them aside to dry. Set out dried bugs and paintings from the previous sessions. Set out small containers of white glue and brushes. Explain to the children that they will each be gluing their bug onto its habitat using a piece of Styrofoam. This will make the bugs three-dimensional or stand out from the paper. After deciding where to place the bug on the painting, apply glue on one side of the Styrofoam and attach it to the back of the bug. Then apply glue to the other side of the Styrofoam and attach it to the painting. Have the children place their bugs in their habitats. For fun, the children can bend the legs of their bugs to make them more three-dimensional. Note: Gluing the bugs onto the habitats will not take long. This is a good opportunity to have a discussion with the children about their work. 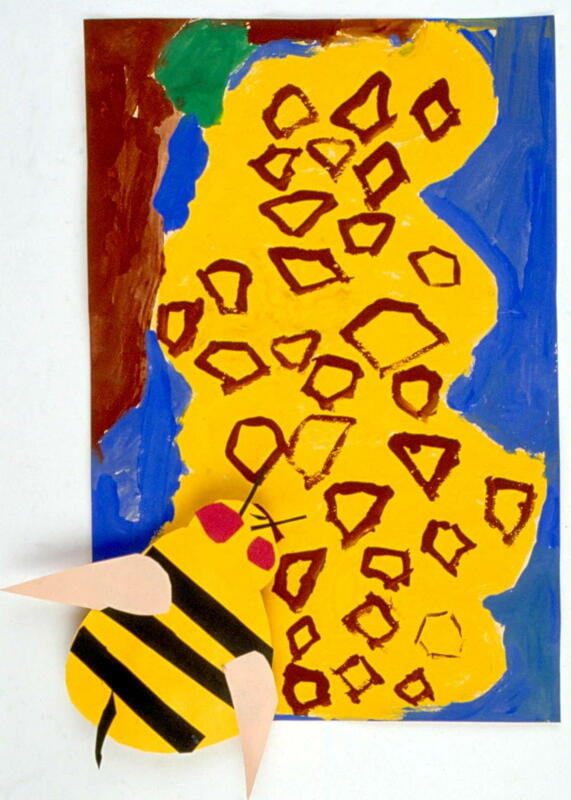 Encourage the older children to completely cover the papers with paint, adding backgrounds for the habitats. When working with three- to four-year-old children, the construction paper can serve as the background for their habitats, since they tend to cover many charming details when using paint. Do the paintings of the habitats fill the papers? 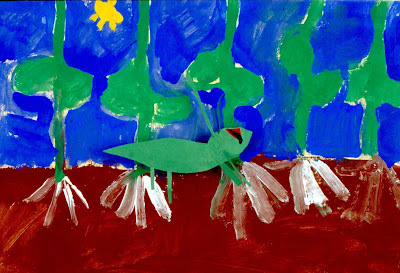 Have the children tell about their bugs and their habitats. Ugh. My fingers are sticking to everything. I need green paper for my grasshopper and there is none left. My bee is so big, it covers up the hive. When you look closely at bugs, they are full of interesting shapes and patterns. I have extra green paper and you can also look in the scrap paper bin. You can glue your bug on the edge of the paper so it won’t cover your painting.